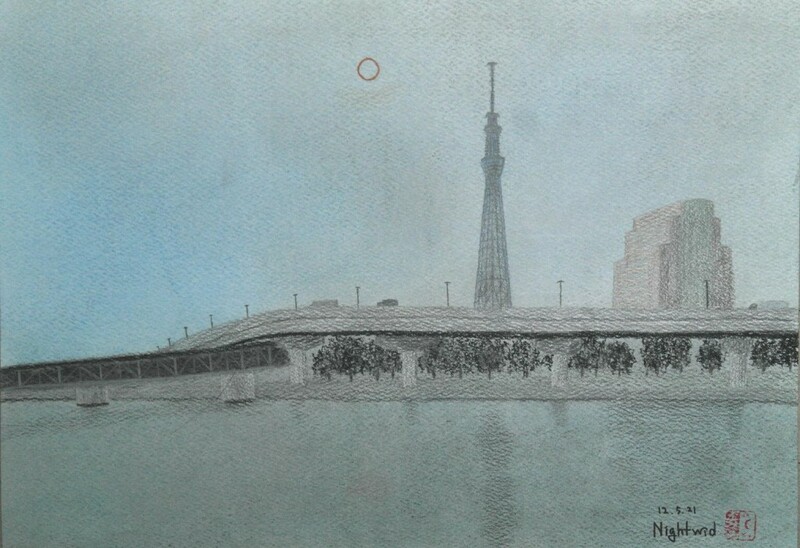 Over eight years ago on March 17, 2007, ASOD launched with our first sketch of the day. 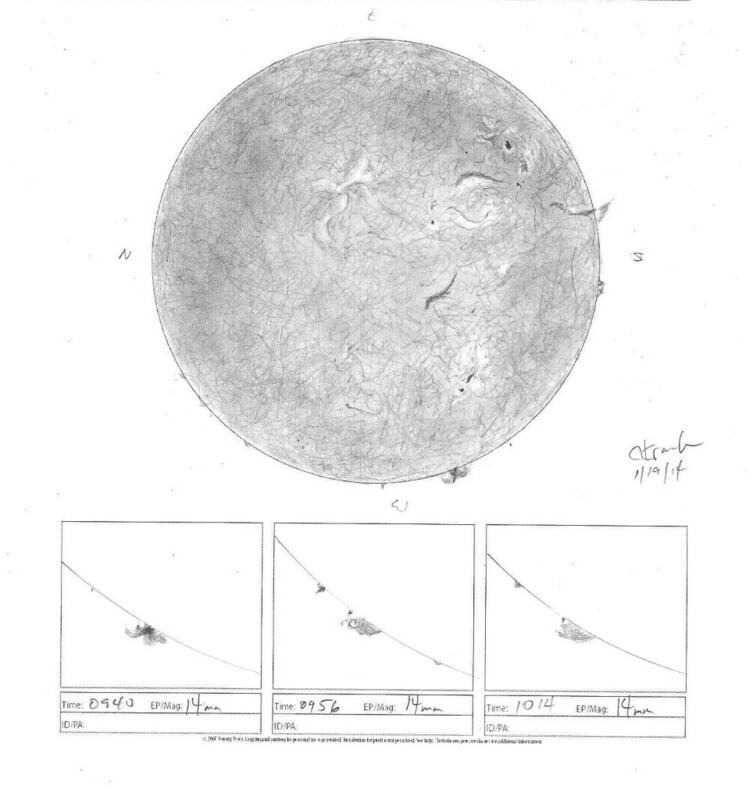 In that time, it has been our honor to receive and publish more than 2,800 astronomical sketches from observers of all backgrounds across the globe. You are the ones who have made ASOD successful. Along the way, the administration of the site has been a home-brewed effort–from site design and administration to the daily processing of your excellent submissions. As you have noticed, it’s not without a few glitches. We value the site, our contributors and our visitors greatly. However, Rich and I have reached a difficult cross-roads. We have both found ourselves at a point where we are unable to continue keeping the site current. For the time being, we will not be posting new submissions. 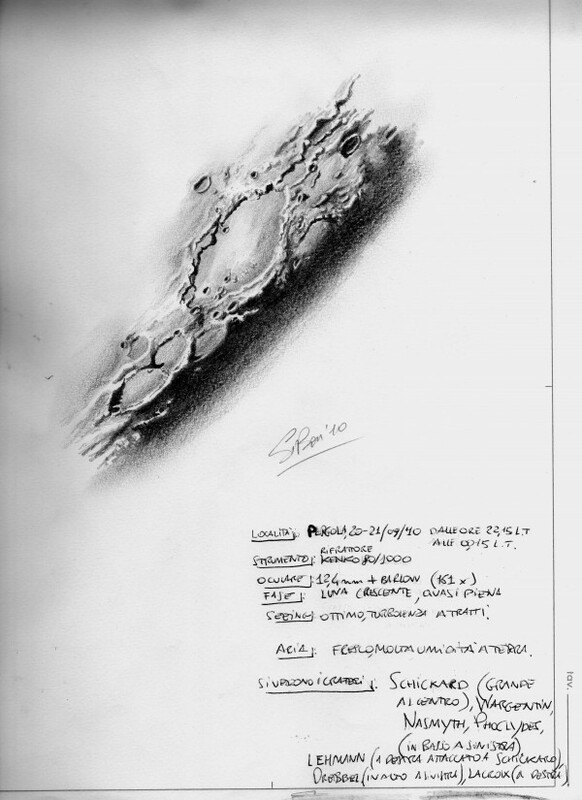 However, we intend to keep this vast and inspiring archive of astronomical sketches live and accessible to all. If we can determine a viable path to restart daily posts, to increase engagement and quality of the user experience, and overcome a number of growing technical challenges, we will make sure to announce it here. Thanks again for all of your support for this rewarding facet of amateur astronomy. IC 405, Caldwell 31 or the Flaming Star Nebula is an emission/reflection nebula that requires darkness and patience to pull details out. A 12.5” reflector was used here to observe and a NPB filter from DMG optics helpful. 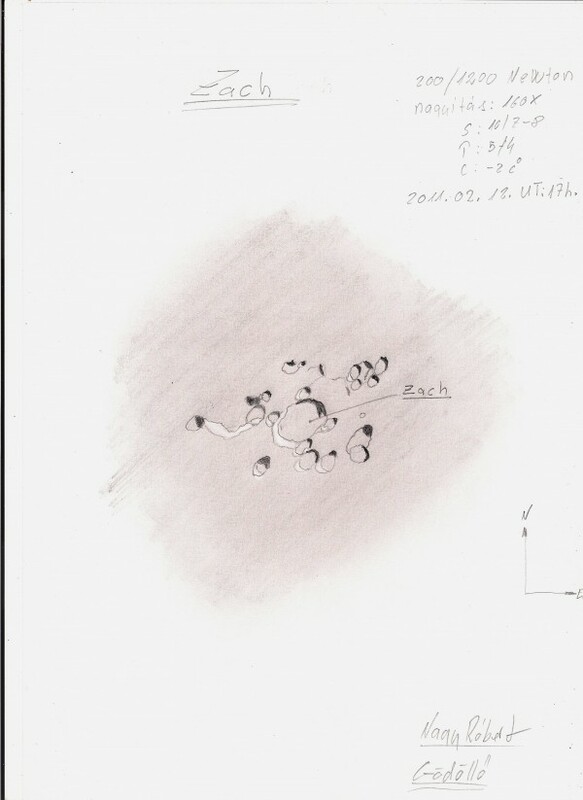 I observed & sketched the same object 3 years ago and didn’t see the details visible this time around. I would partly account this to gaining greater ability from sketching the object again with more patience this time around. Proper motion studies of AE Auriga show it to be an ejected star from the Orion Belt region. 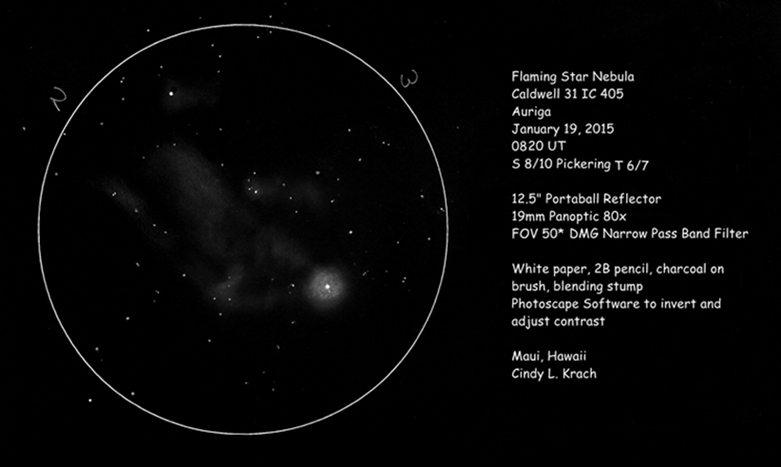 Its chance passage through this nebulous region of gas & dust give it a “Flaming Star” appearance. Heavyweight white paper, 2B pencil, charcoal and brush. One thing all astronomers chase is ideal atmospheric conditions. An apparently clear night can present poor transparency or poor seeing due to thermal energy high up in the atmosphere. But every now and then, ideal or even very close to ideal conditions do present themselves, and it gives us the finest view of the heavens. Such conditions presented themselves to me on the night of January 18. My first view of Thor’s Helmet, NGC 2359, was four years ago during the Ice In Space Astro Camp. My view of it seemed to me to be a fine one. So much so it inspired me to sketch it straight away! Four years later, presented with a night of exceptional transparency, I revisited Thor’s Helmet as it was right on zenith for me. WOW! What an image! This night Thor’s Helmet had nebulosity extending in four different directions, not just the two from my first view. So much more structure was apparent, and the nebulosity extended so much further, and so many more stars were visible too. I’ve also included an image of the sketch I did of Thor’s Helmet in 2011 for comparison. It is this way that the full impact of the differences in conditions between the two nights can be appreciated. I hope you enjoy this sketch. Sketch: Pencil on paper and then inverted after scanning into the computer. 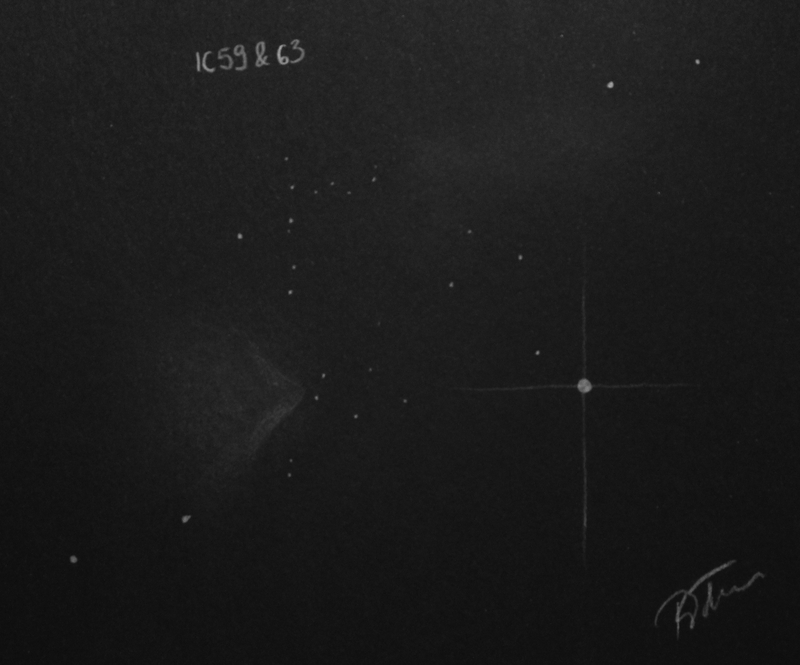 This is a sketch of open cluster IC 4756 in Serpens made on September 16, 2012 with a 6″ F/5 dobsonian reflector. Very large cluster of stars near the pretty double Theta Serpentis. 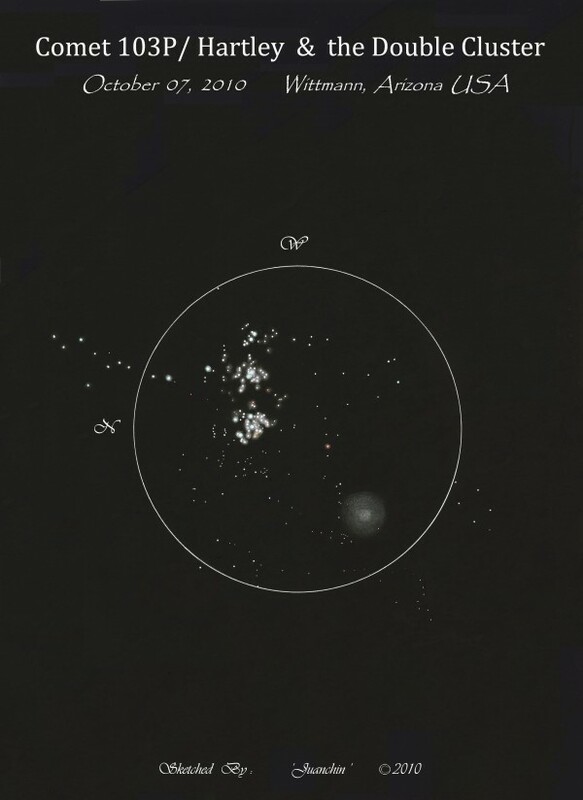 Some 30 – 50 stars were counted in the cluster which appears to have several concentrations of stars separated from one another by voids. the cluster fills the field at 75X. 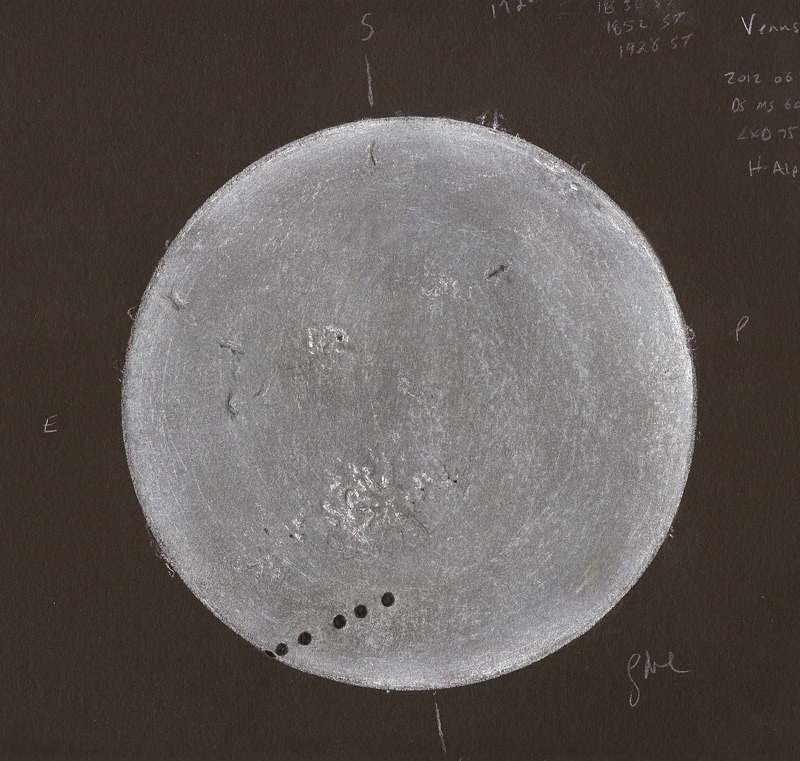 Planet Mars on sunday 13th of april 2014, sketch is made five days after mars was in opposition. We should expect that during opposition – april 8th – the smallest distance between our blue and the red planet is achieved. 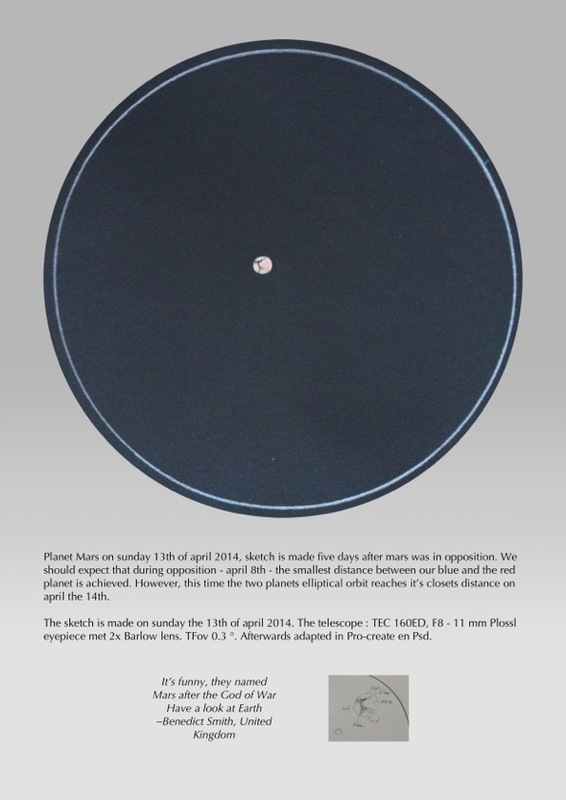 However, this time the two planets elliptical orbit reaches it’s closets distance on april the 14th. Three nights in a row clear sky, it doesn’t happen a lot in cloudy Belgium. I guess I was just lucky. Nice to see the changing shadows and libration. I hope you like it too. A great day spent with my new 60mm Lunt. I am amazed at the detail difference between the 40mm PST and the new telescope. Conditions were excellent and I enjoyed watching the bright prominence to the W change over a short time. There was also a lot of brightening and dimming plague activity. 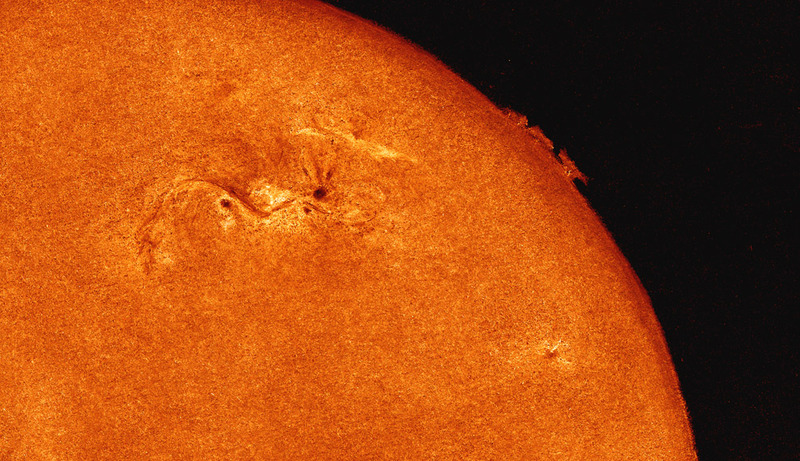 The most fascinating region was to the SE where a thick filament danced off the limb into a prominence and appeared multidimensional at higher magnification. Two NGC numbers, but only one object. 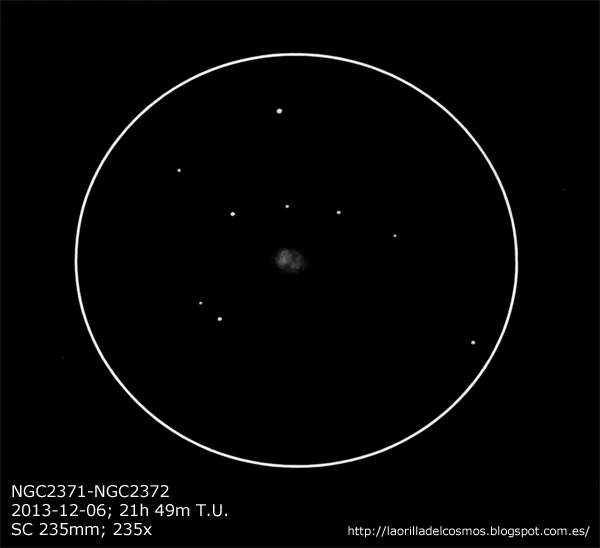 NGC2371/NGC2372 correspond to a bipolar planetary nebula. 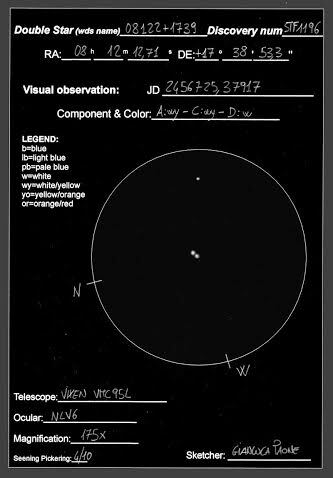 Easy and awesome observed from a dark skies with a good telescope aperture. A lobe is more brilliant than the other, but both are perfectly visibles. I think it could be an affordable object for medium telescope aperture as well. 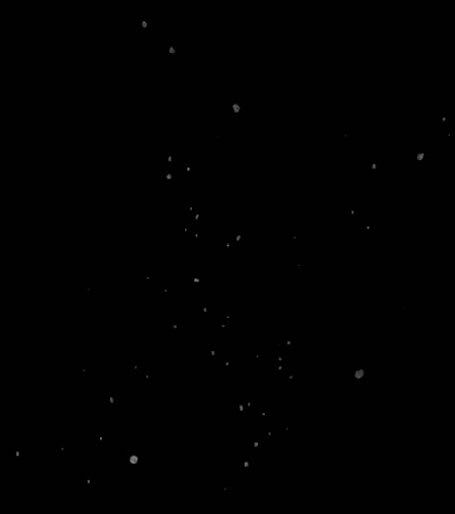 Media – White pastels on black paper. 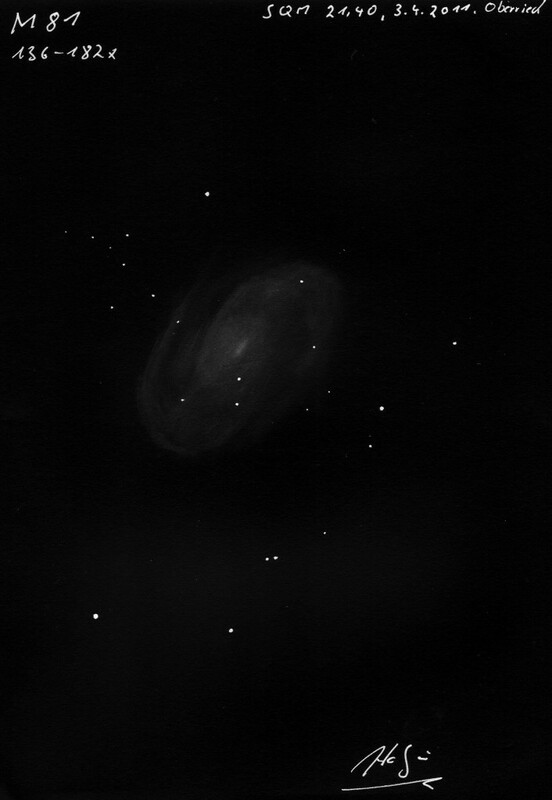 Very small galaxy that improved with lots of magnification. Bright core makes it an easy find even with low mag EP’s. High level cloud made the transparency poor making it very difficult to see any detail but I could just make out a couple spiral arms inside the halo of the galaxy. Very nice object and will go back to under better conditions. 2012 has seen the loss of another legend and inspiration. 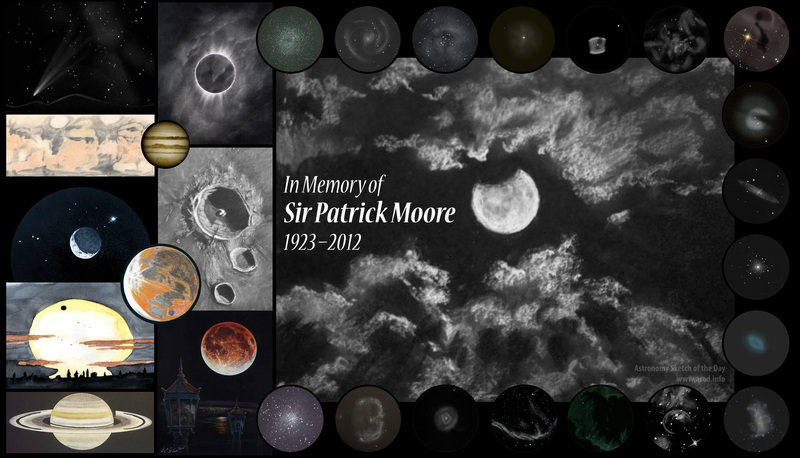 We mourn the loss of Sir Patrick Moore, who passed away on December 9th. Today’s tribute includes a selection of Lunar, solar system, and deep sky sketches featuring objects from Moore’s Caldwell Catalog. This is an excellent view of the constellation from the city. The intruder is a meteor that streaked through, it was white. 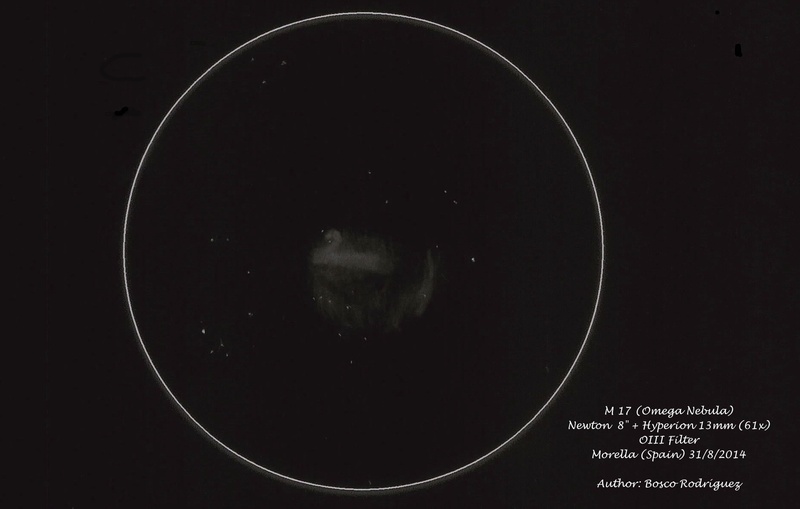 Also visible is M42. This picture is the moment of annular eclipse, the gold ring and the surrounding landscape. 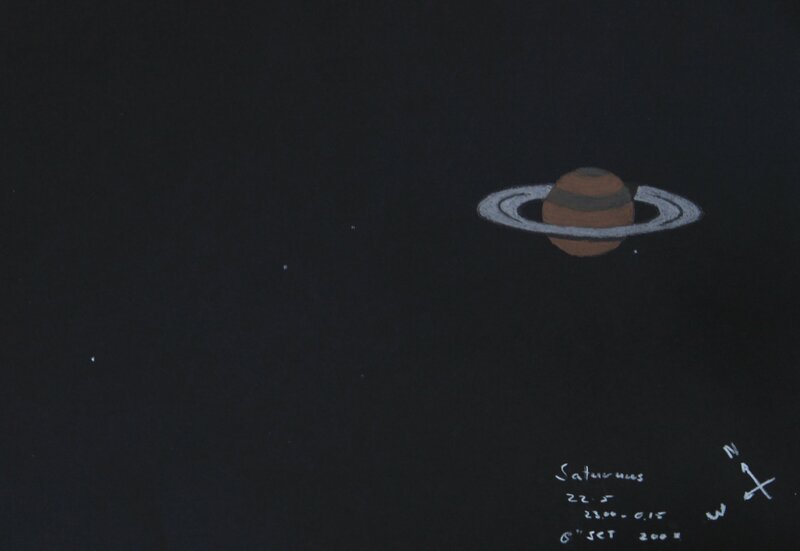 Last night, May 22-23, I had a nice view on Saturn so I placed my 8”sct/lxd75 on the balcony and tried to make a sketch. It was made with pencil on white paper, and later redrawn with pastel pencils on black paper (A4). The planets disk is approximately 3cm and the rings 8cm. At 200 times the Cassini Division was easy to spot, as well the two most westerly moons Titan and Rhea. At around 23:30 I was sure I spotted another moon close to the planet, Tethys, but later in de evening I couldn’t see it anymore. It had crossed the planet. While looking at the Cassini Division another moon popped in to my averted vision, this one between Rhea and Saturn; Dione. & Clear Skies 4 all. I set up my dual mounting rig for both white light and h-alpha and my husband set up his LX200 with a white light filter as well. We picked a spot in the front field to optimize the horizon for sunset. 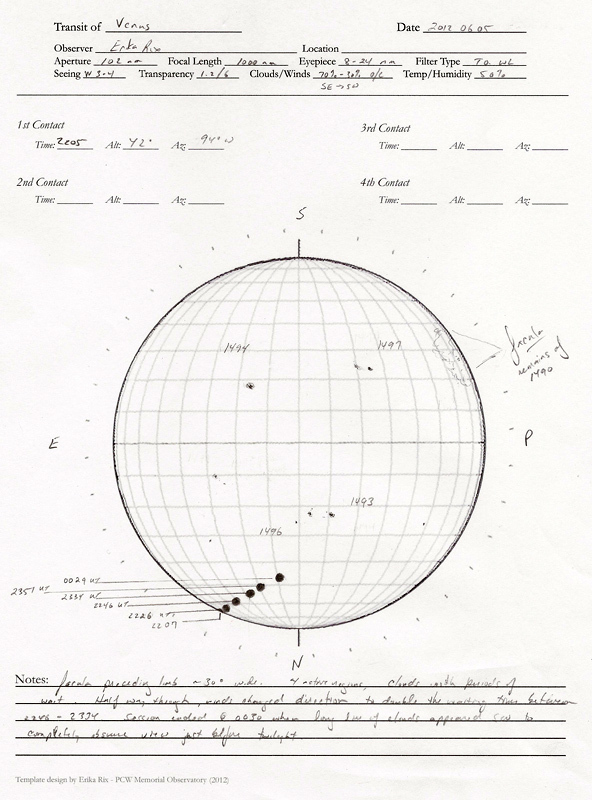 I had already utilized my sky planning tools so that I knew when and where first contact would be for my scopes and had templates on two different clipboards to record my observations, one for white light and one for h-alpha. Paul had my Canon EOS DSLR Rebel hooked up to the LX200 for his imaging session. 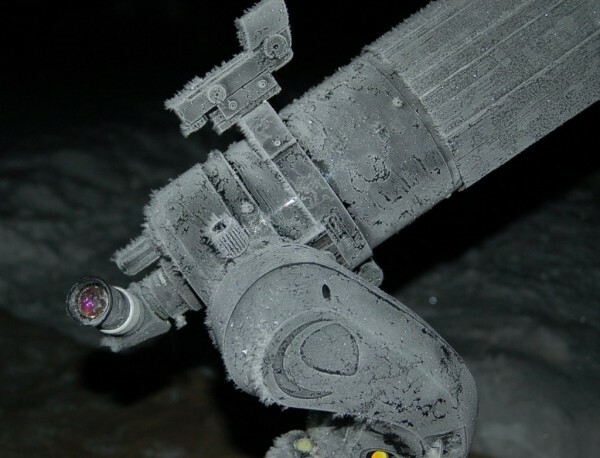 In the mean time, temperatures had gone up to 101.3 F.
The countdown began and at 2205 UT (1705 CDT) first contact was made on the NE solar limb. Just as it bit a little more into the disk, the first cloud rolled across my view preventing me from witnessing the progression into (and including) second contact. It was disappointing as I wanted to recreate Capt. 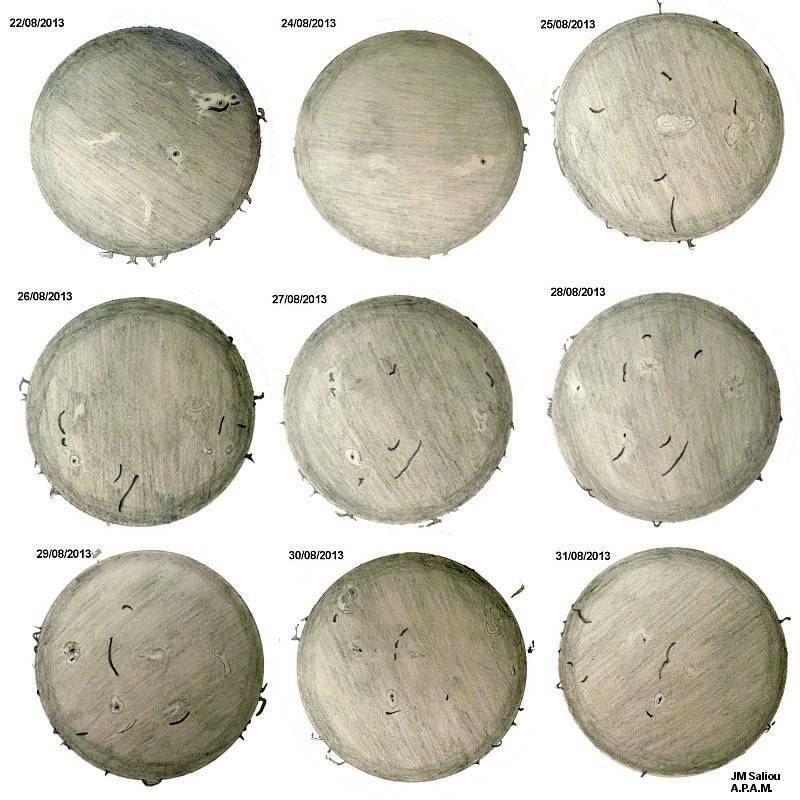 Cook’s and Charles Green’s observation/sketches from 1769. My first instinct was to view first contact through h-alpha in an attempt to view more of Venus’ disk prior to transiting in front of the limb, but the transparency was bad and seeing was moderate so thought I would stick with white light for a crisp “entry”. Due to the dual mounting system, I could easily switch between the two filter systems in the first few minutes of contact. Finally, finally, finally! A clear day! 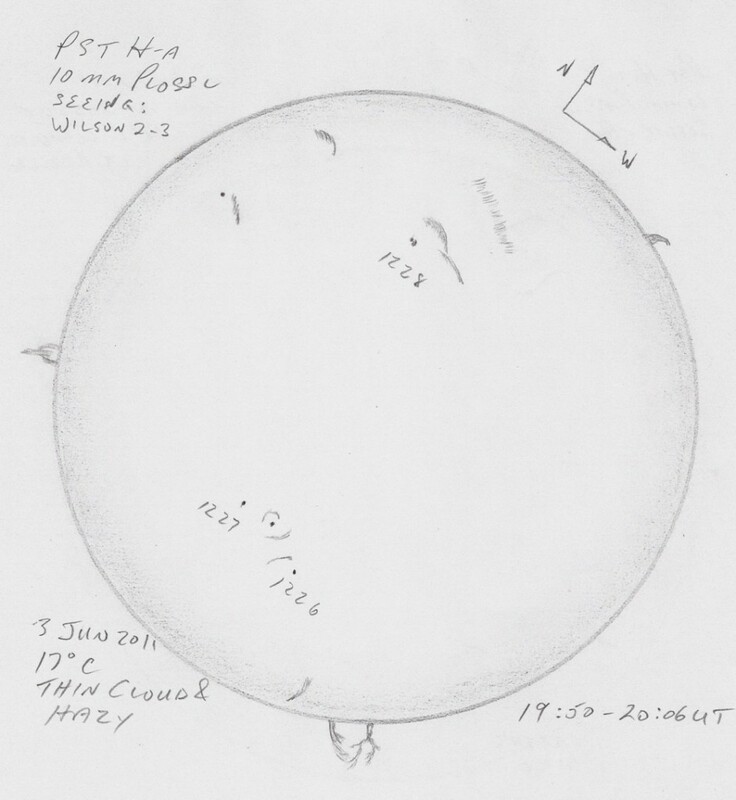 The last week has been mostly cloudy with only a few minutes of sunshine at a time; too short to make a sketch of the Sun. But today started with a deep blue sky with just a few tiny clouds. I set up my 90mm solar telescope around noon and made a sketch of AR1429, the region which might deliver northerns light in the night to come (a very rare sight in the Netherlands). The whole thing was swirling very slowly, changes could be noticed within minutes at 70x so I had to draw quickly. I would like to take a few hours to sketch all the tiny details, but because of the movements solar sketching is always a race against time. 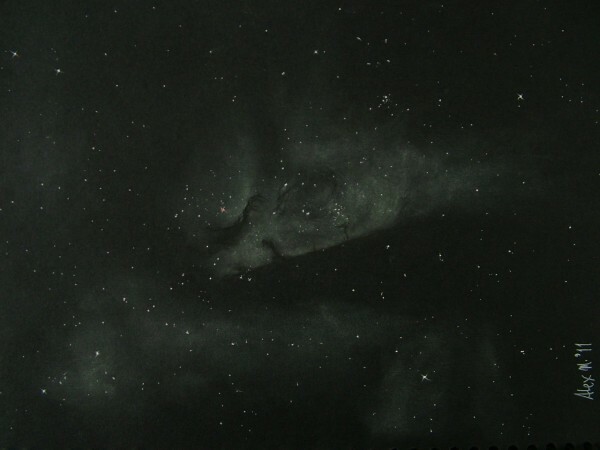 I made the sketch with white pastel on black paper, later mirrored to match the real orientation (north up, west right). Color added with Photoshop. Kind regards and clear skies! Scope time has been very scarce this year. This sketch was done in April. 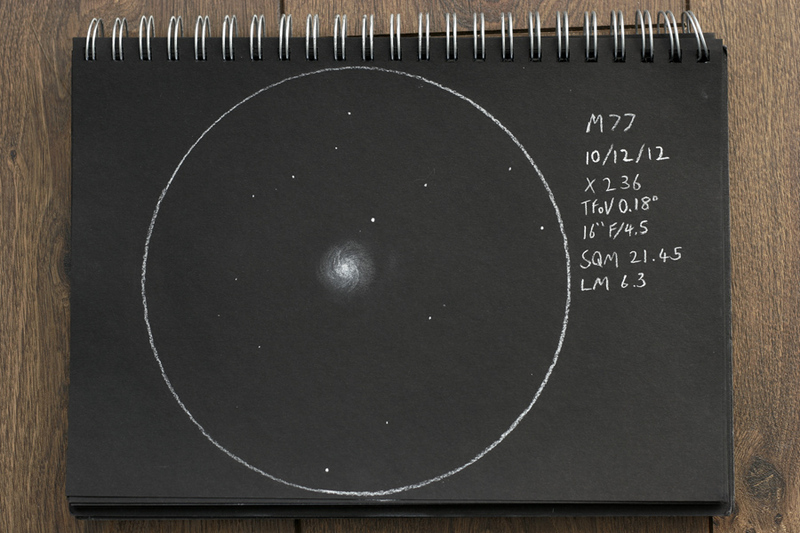 Encouraged by my attempt at Eta Carina through my 8″ dob, I trained my 17.5″ dobbie at the same target, again from Sydney. This time, I also used my Grand Daddy of all eyepieces, a 35mm Masuyama. A bit long for this f/4.5 scope, but my only OIII filter was a 1.25″. Eta Carina is not only huge, it is a very busy place. There are multiple shockwaves within it, masses of star formation both just initiated in the form of dark pillars, of those whose nuclear fires have just kicked in, nebulae within nebulae, and a super massive star about to go supernova. This magnificent NASA site shows all of these details. Again, the Homunculus Nebula is too small at 57X, but the supermassive star, Eta Carina, it is associated with is the bright reddish one. Armed with a battery of sketching implements, the result of 3hrs is below. Ooooohhh, I am going to have soooooo much fun redoing this one at a dark sky site! The weather was awful, what to say: I had approximately 30 minutes to sketch. 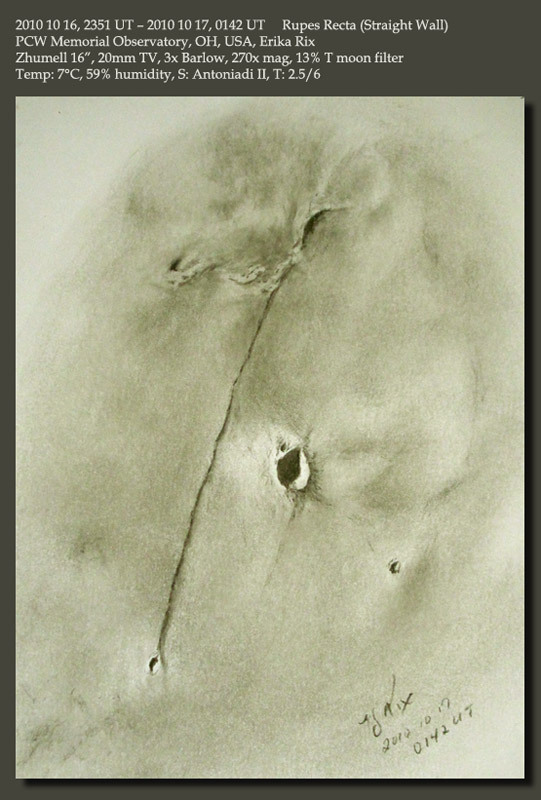 However, I liked this crater very much, so I tried my best to draw it. I quickly done a sketch then worked out my final draw in the room when all the milky clouds covered the Moon. This digital drawing preparated GIMP 2.6 programs. The choice of the Hungarrian-born astronomer Xavér Zach (1754-1832 ) crater was named after. The crater is located southeast of the Clavius. 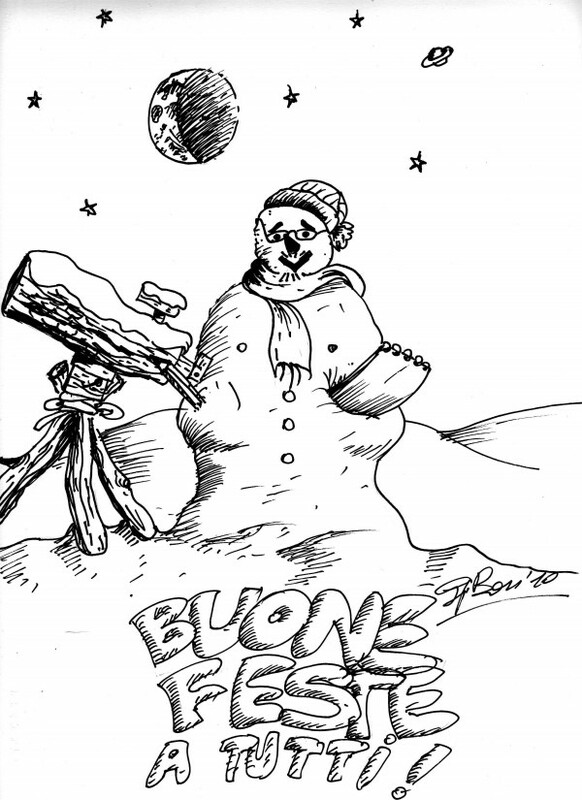 Merry Christmas and Happy new 2011 at all artists !!!! After many hours of the good observations we take a little nap. 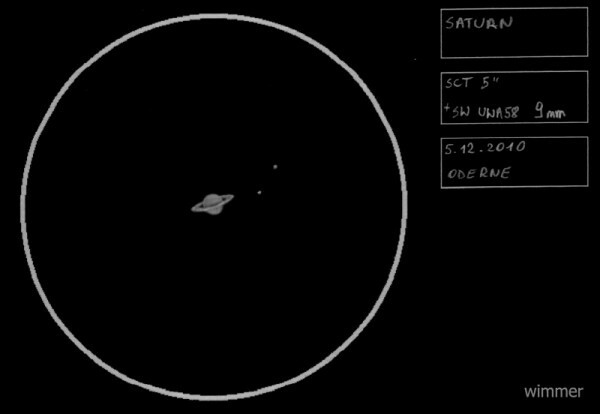 We have resumed our observations at 4 AM to get the first Venus and Saturn since few months. There was intense, severe frost. Weather: Clear, dark sky. Heavy frost. I have a interesting foto from that observations. There was really heavy frost. After all my equipment was operating quite good 🙂 There was strange noise from motors of my Celestron SLT mount, like howling 😉 But all night long it was operating correctly. I have little problems with corrector plate of my C5 SCT too, but dew shield works not bad. Most problems we have with the eyepieces. Puting the eyepiece to the poket at several minutes – that was an easy solution of this problem. Sketch created scopeside with Rite in the Rain paper and charcoal. from the west. The slope incline is ~30-40° (ref. 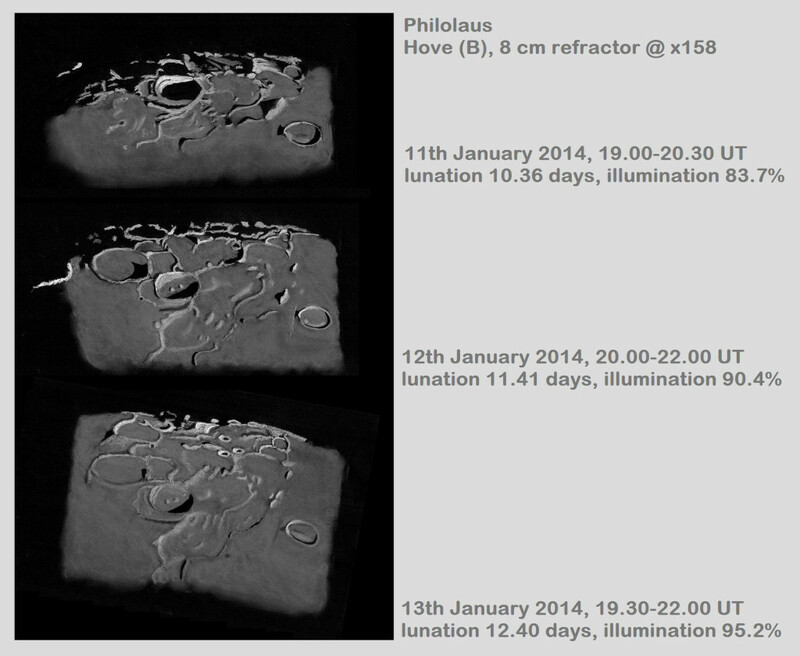 Virtual Moon Atlas). during my observation last night). Medium : Charcoal pencils, fine markers, painting brush, windows paint for inversion and color touch up, white paper. 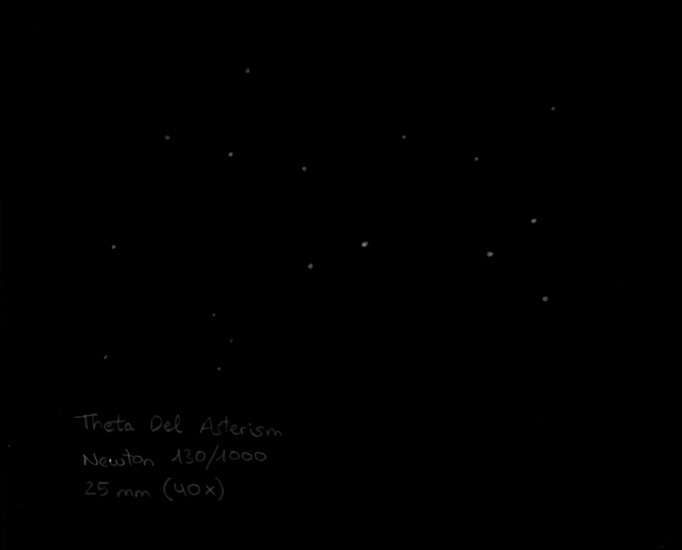 Weather : New Moon!, dark and clear skies, no clouds, no winds, ambient temperature of 85 deg. 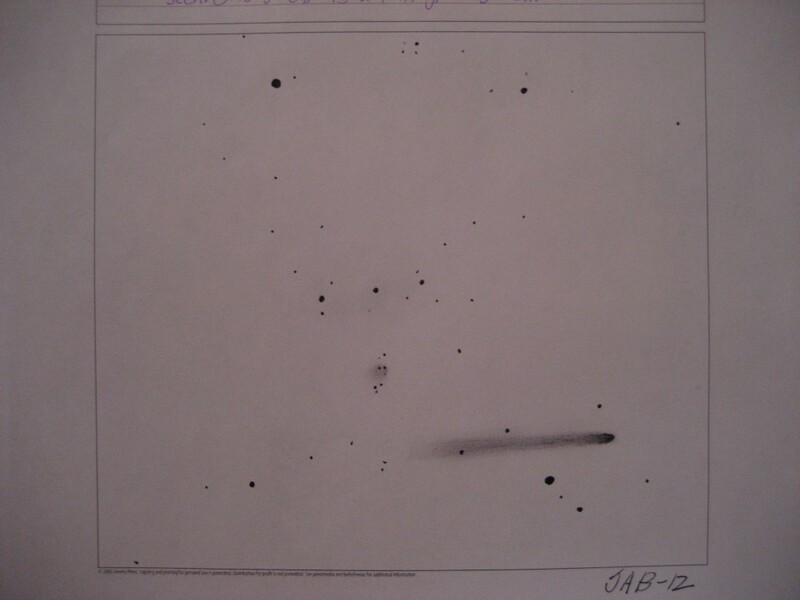 F.
I finally gave it a try to sketch this all inclusive view of the Double Cluster and comet Hartley. The naked eye open clusters of NGC 869 and NGC 884 are clearly visible, but the elusive comet 103P/ Hartley is still a bit of a challenge to notice without the aid of binoculars or a rich field telescope. 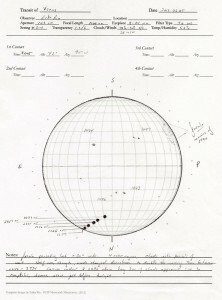 Comet Hartley is so diffused it was reported to have a 31 arcminute coma as of the date of this report. Depending on how much light pollution you are pestered with, that might keep you from seeing the comet in its entirety- or you may be looking at only the brighter portion of the nucleus. Speaking of brightness, I was able to compare its magnitude to some defocused stars nearby and I conclude to estimate it at 7.5 or 8. Obviuosly not a naked eye object, just yet! It would’ve been nice to detect the color but the diffused nature of comet Hartley doesn’t bring out the green hue comets are associated with. Right now only in photographs will you enjoy that treat. 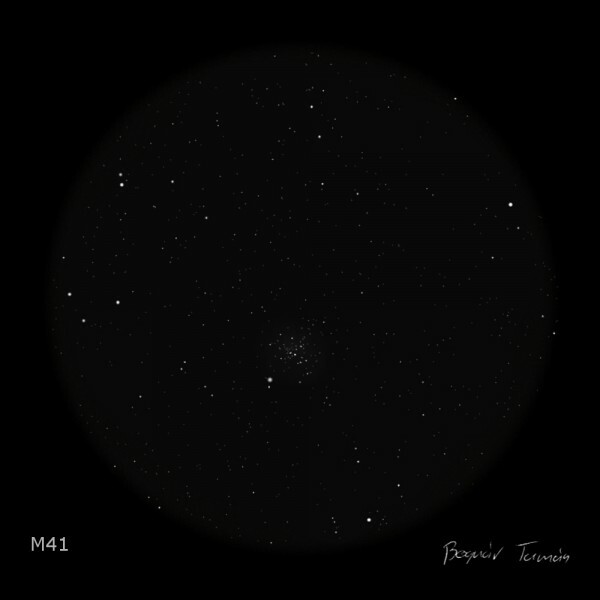 The Double Cluster with an average magnitude of 4.2 is best appreciated under the view of binoculars. From the city, it’s hard to notice the the faint misty glow, but from rural areas, it stand out almost immeadiately if not with averted vision. 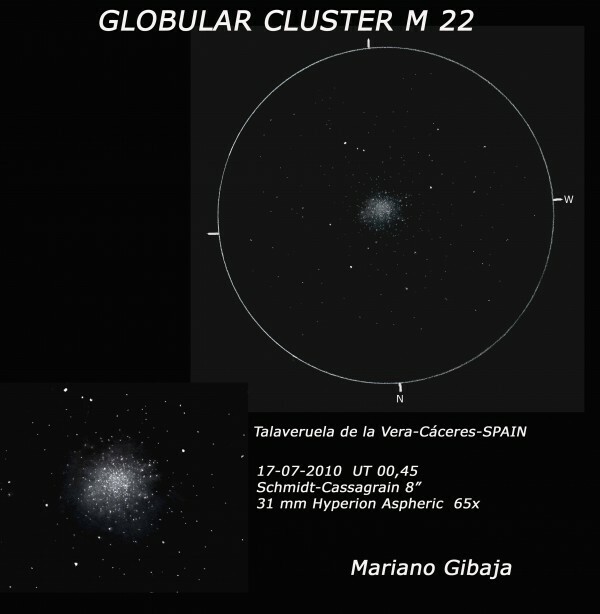 Through the binoculars or a 4 to 6 inch telescope the clusters show their true beauty. Mostly composed of young blue stars, they also host a sprinkled few orange stars that add to the visual interest. Both are great low magnification targets to be admired. Keep looking, keep sketching, keep submitting, maybe comet Hartley has a surprise for us in the next few weeks! HI ASTROARTISTS,ALL O.K. ?I’M FINE IN THIS MOMENT.YESTERDAY, FINALLY,AFTER TWO DAYS OF BAD WEATHER,RAIN ,WIND,THUNDERSTORM AND LANDSLIDES,ONE GOOD EVENING FOR OBSERVATION.I SEE THE MOON CRESCENT AND JUPITER AT EAST AND I SAY:” I WANT TO MADE THE NEW SKETCH ABOUT MOON AND JUPITER!”. 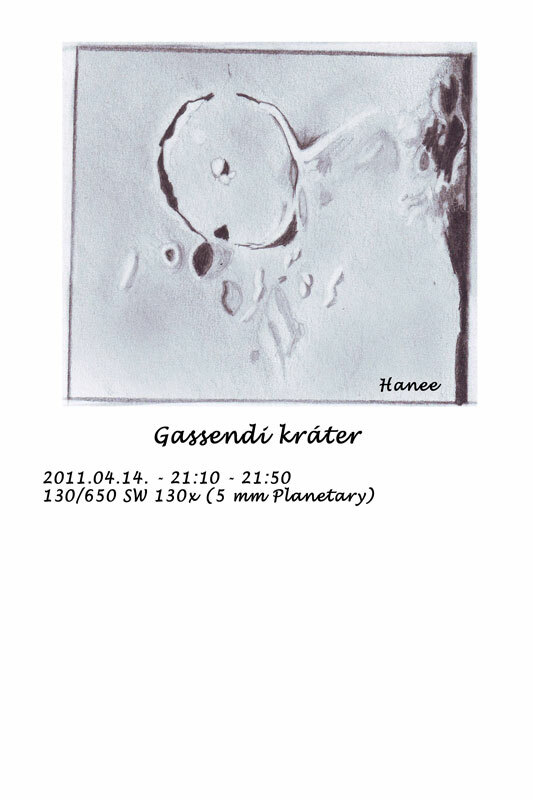 I TAKE MY REFRACTOR KENKO 80mm AND 1000mm OF FOCAL LENGHT AND STAY BEHIND MY HOME.THE SKY WAS CLEAR,THE WIND HAVE CLEAN THE AIR.I START MY SKETCH AT 10,15 p.m. AND IMMEDIATELY I SEE IN THE EYEPIECE THE FANTASTIC VIEW OF SCHICKARD WITH OTHER CRATERS NEAR HIM.I END MY WORK AT 12,00 a.m.OF THE DAY AFTER.I WAS TIRED BUT SATISFIED ABOUT RESULT. I HOPE LIKE YOU…..CLEAR SKY AND GOOD WORK AT ALL. INSTRUMENT:REFRACTOR KENKO 80mm 1000 f.l. SEEING:GOOD AT THE START,TURBULENCE AT THE END. TECHNICS:GRAPHITE PENCILL (FROM 4H TO 6B)ON WHITE PAPER ROUGH FOR GRAPHITE SKETCHES. Omega Centauri and 47 Tucanae.